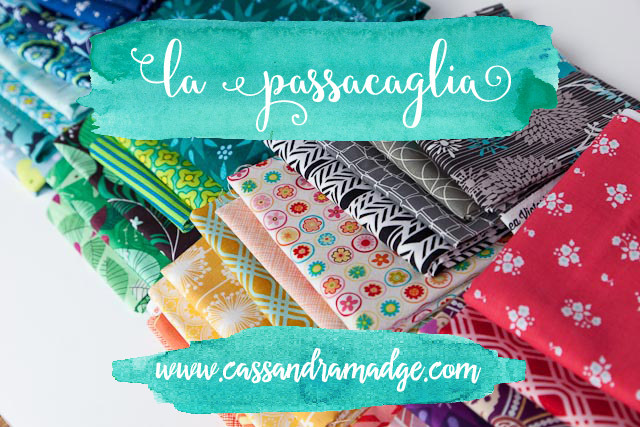 Have you caught the Passacaglia bug yet? If you have an interest in English Paper Piecing, it’s a quilt that has a huge following and frankly, an insistent siren call. Sooner or later, you will succumb. The pattern is from Willyne Hammerstein’s first book, Millefiori Quilts, and is the cover star of course. Based on the traditional Millefiori glass from Italy, it is made up of multiple overlapping and intersecting cogs, filled with 5 simple shapes. For epic colour inspiration, search La Passacaglia on Instagram. 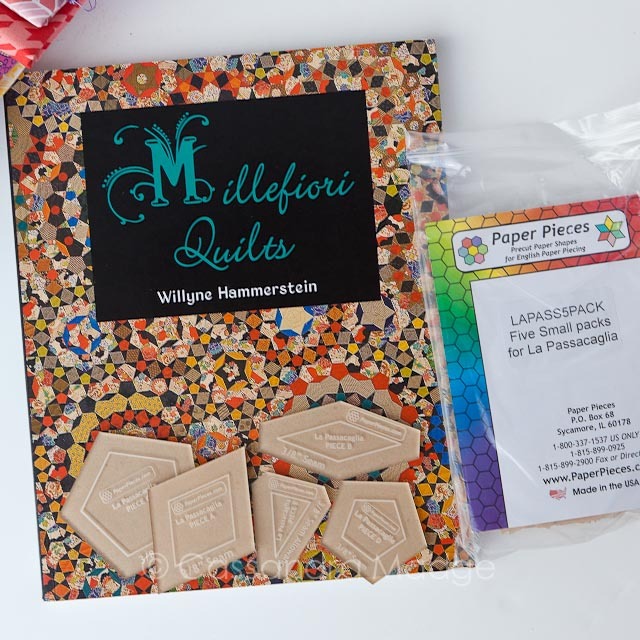 For information, support and more ideas, there is a dedicated Millefiori/La Passacaglia group on Facebook. Some months ago, I was lucky enough to win a copy of the Millefiori Quilts book, along with the acrylic templates and enough paper piecing papers to get started (find papers in Australia from Sue Daley’s Patchwork with Busy Fingers HERE.) on my own La Passacaglia quilt – thanks to my favourite quilting magazine, Love Patchwork & Quilting from the UK. I was intimidated by the choices and possibilities, as well as the sheer epic scale of the project, so I put it aside until I finished my Summer Rain hexagon quilt. Well, as of January 1, that IS finished (photos coming later, promise! ), and I am ready to start with a new hand-sewing project. As I knew this project was drawing nearer, I have been carefully stalking the different quilts being made, and collecting fabrics that in my mind are ideal for this type of piecing. There are two basic requirements for this quilt – the pieces are for the most part, very small, so large scale prints will be totally lost. 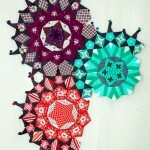 In fact, they may even come out looking like solids and not prints at all! 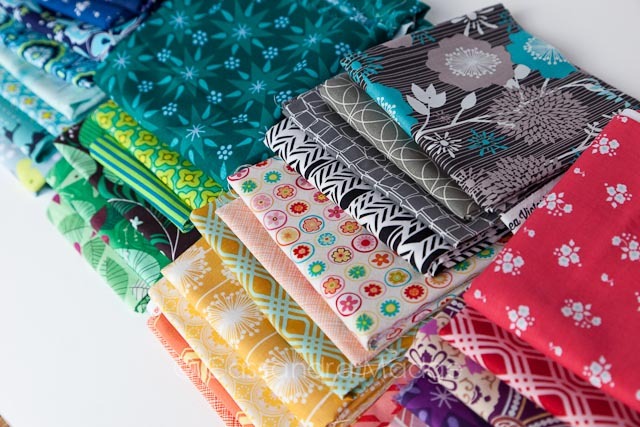 There are also lots of intersecting shapes, which makes ideal fodder for fussy cutting – selectively using parts of the pattern to highlight individual motifs or to even create a secondary pattern caused by those intersections, making it ideal for using geometric prints with lines and stripes. I am hoping to make a start over the next couple of weeks on cutting and preparing for my first rosette, and I think this will take a bit more brain power than I used with my Summer Rain quilt, which is completely scrappy with only very simple placement rules. 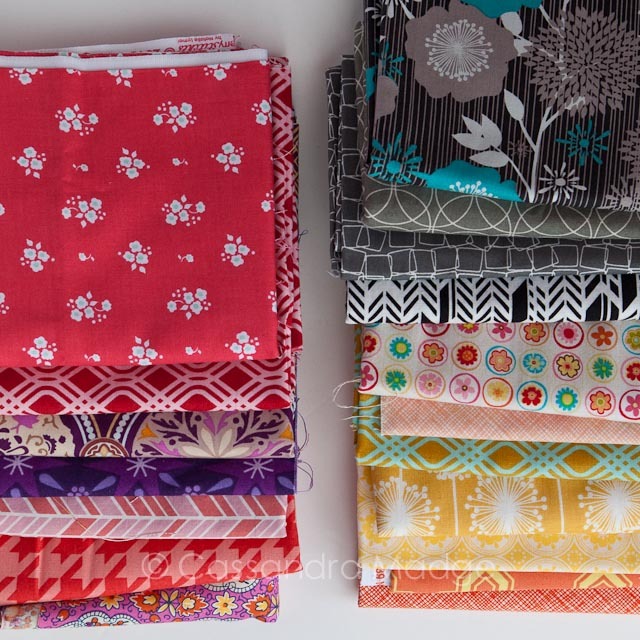 I will be adding solids into the quilt, you can see in the cover picture above the tiny black stars which draw the quilt together – I hope to make a similar approach. My basic colour palette is for bright and fresh colours – limiting the muddy browns, reds and khakis of more country style quilting. Definitely no beige! Although I don’t particularly want to make a “rainbow” quilt, I would like to see a representation of all the different colours over the quilt – to imitate the glass versions of millefiori – a non quilting inspiration for my is Lily Mosaics in the UK, who makes beautiful Millefiori Jewellery. One benefit of the tiny pieces involved is that this is an ideal candidate for using up some scrap fabrics – those too precious to throw away, but too small to use otherwise. 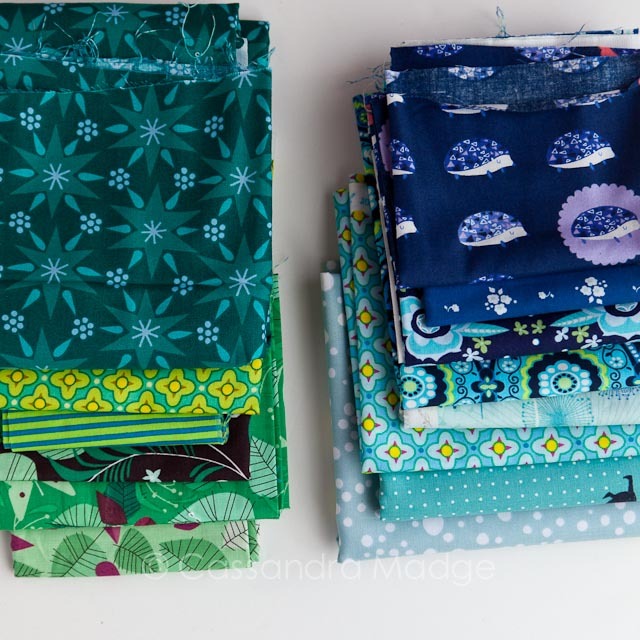 Yes, I’m looking at you Anna Maria Horner and Tula Pink! Because this quilt will likely be a long term labour of love, I am using that to my advantage, pulling out all my favourite colours and fabrics, the precious pieces that I have managed to collect from Lizzy House, Alison Glass, Mo Bedell, Amy Butler, Joel Dewberry etc. You can see quite a few of them in these photos. It’s useful lining them all up like this – I can see that my purple collection is sadly lacking, and that my reds are more pink than anything else. Something to keep in mind as I slowly curate more fabrics to be used. So, all I need is a spare couple of hours to pull the first rosette’s fabrics, cut and sort, and I’m ready to start basting! Tell me about your long term labour of love craft projects. Is it hand piecing? 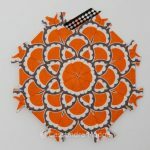 Hand quilting? What’s your favourite part of the process? Cassie’s La Passacaglia – First Update! Thanks for showing your fabric pull and your thoughts on getting started. I bought the book and paper templates before Christmas but haven’t even started getting my head into the colours I want to go with, I love the idea of darker colours and solids framing the lighter ones. Thanks so much Ruth. I’ve finished my first Rosette, but I think this is one of those quilts where a) it will always be possible to overthink it/second guess it, and b), if a colour doesn’t work out, it’s not the end of the world. You can remake a rosette or use it in a different position with a bit of tweaking. I think you should start pulling out fabrics that make you happy and jump in!! I’m looking forward to seeing your progress. 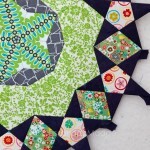 I have been following many others doing these quilts and they are just beautiful! I wish I had the courage to start but it just seems too overwhelming for me even to choose fabrics. So I’ve opted to work on smaller hand projects building on different epp shapes. 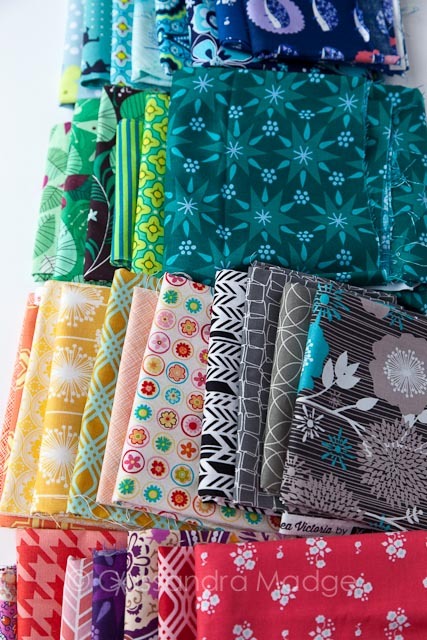 Love the fabrics you have pictured above. Did you ever get started? It’s a bummer that Willyne sold her quilt before the Houston show (also disappointing).